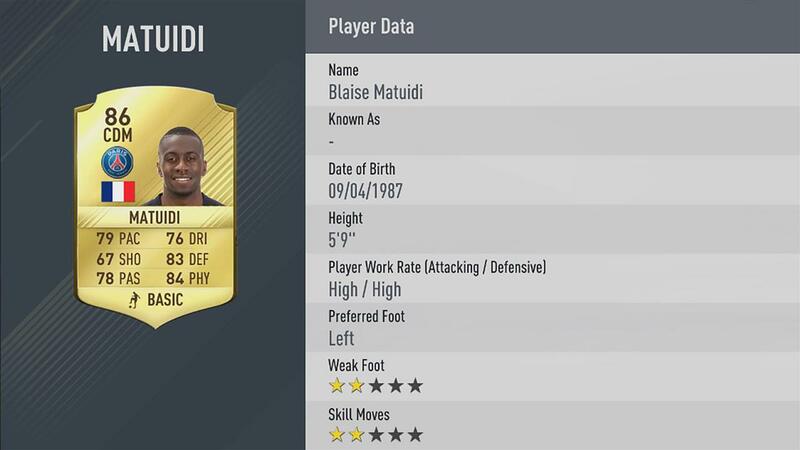 Blaise Matuidi is a strong and skillful central defensive midfielder. His 84 Physicality and83 Defending make him a good shield for the back line. Real Madrid's Marcelo stats are highlighted by 84 Dribbling and 82 Defending. PACE! PACE! PACE! The Dortmund striker's Pace in FIFA 17 is a frightening 96, in addition to his impressive 84 Shooting. It was an incredible season for the West Ham United left midfielder. Dimitri Payet is one of the biggest risers this season and boasts an 87 Dribbling and 87 Passing. The FC Bayern right winger continues to be one of the premiere attacking talents in world football. He will terrify opposition back lines with his 90 Dribbling and 86 Pace. The FIFA 17 Ambassador, James, is an incredibly well rounded option at attacking midfield. His 85 Shooting, 85 Dribbling, and85 Passing make him a key link man. The elegant Spanish playmaker remains an impressive figure in world football. His 87Dribbling and 87 Passing make him an enticing option as an attacking midfielder. Still a destructive force in front of goal, the Real Madrid striker has the ability to win any match. His 84 Shooting and 82 Dribbling will be a nightmare for defenders to cope with. Vidal possesses the ability to be a destructive force as a center midfielder. His84 Physicality and 84 Defending will add bite and enforcement to any midfield. An incredibly versatile defensive midfielder, Sergio Busquets does everything well. His 83 Defending and 81 Physicality make him an impressive support for the back-line.